The following content I will show how to create an integration using the Salesforce REST API. Accessing objects in Salesforce organization using REST does not require WSDL. Well-suited for browser-based applications, mobile apps, and highly-interactive social applications. REST API use data format in JSON or XML and works as synchronous communication. 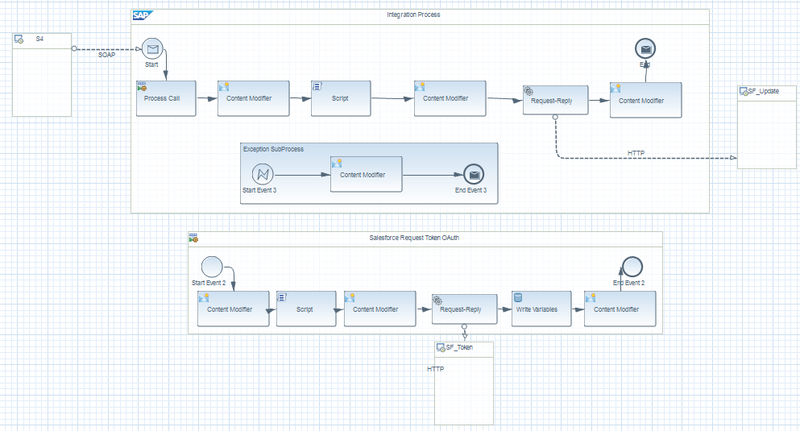 The better option to create a full scenario is separate the OAuth and Main Flow in 2 iflows to re-use the develop and Salesforce session in multiple calls (explained in Bhavesh Kantilal´s posts). I included in on iflow just to present the end-to-end solution in one post only. Provide de grant_type content to be used on groovy script and inputPayload to be used after the token session. The Secret and User parameters was storage on 2 Security Credentials for security and maintenance reasons. The script will return a query that should be used at the next step. At this point we should provide to the HTTP Communication Channel a query to request a token. We will use a dynamic query created at the previous script an pass trough the CamelHttpQuery on header. This variable changes the HTTP Query on the Communication Channel. Additionally, I include the header “Accept” to request a “application/xml” at the response, is it possible to request a JSON data also. The access_token is our Session ID Authorization that we need. Remember at the previous step I use the Accept parameter with “application/xml” value, so, we can set variables reading directly the Channel response. Using the same integration flow for request the token and provide the update query, I included the Delete commander on the header and properties to delete the previous parameters that do not be used. Use the ServiceURL parameter to add a variable string to the URL, the value “/services/data/v39.0/sobjects/” request the REST service data and inform the version of Salesforce API. This information will be used on the next script. To update a field on a record, the Salesforce accept the HTTP method PATCH, but the HCI does not provide support on this Method until this moment. The following cURL command retrieves the specified Account object using its ID field, and updates its Status field. In order to resolve the difference between Salesforce and HCI update method, we just provide a POST method on HCI side but including at the URL the command “?_HttpMethod=PATCH“. This information will update the method on calling the Communication Channel request. Note that the Address provided at the Request-Reply is just to have some information, because the correct URL will be change dynamically with CamelHttpUri. I just include a return tag on the final content modifier to return back a XML response. the reason is that the response provided by Salesforce is in JSON format. There is better way to convert the JSON to XML format to get the correctly response. When successful, return an empty message, this is the tag I found to does not return a error for all responses on HCI. In any error message from Salesforce, the error return only the message monitoring on HCI. In order to revert back to the Sender system, I included the exception flow just with the exception.message log on the body. Finally, to test the interface we are using the SOAP UI to provider the Sender message with the External ID and the field to update on Salesforce. This interface is just an example how to use the REST API from Salesforce based that HCI does not support PATCH method and how to resolve it. The interface should have mode fields and is possible to work with a message mapping and groovy mapping to create the complete JSON Query to update the Salesforce fields. I hope this integration process bring how to use the REST API and help in any new integration with Salesforce system. Other patterns and models can be added into the comment sections! The blog is extremely helpful in understanding the now standard OAuth 2.0 based authentication. I have a requirement for OAuth 2.0 based authentication. I have to send the session_id as part of the message to get the authorization code. The authorization code is then sent to the token URL to fetch the OAuth token. What I am not able to do is to grab the cookie from the response and set it to the outgoing message. Below is the requirement. Please, can you tell me how I can achieve it. you need to send a HTTP POST request to Auth Server.